Linguine (pronounced lin-GWEE-nay), Italian for "little tongues", is a narrow, flat pasta resembling a cross between spaghetti and fettuccini. Linguine works well with almost any type of sauce, though is often paired with white or red clam sauce or cream-based sauces. It is often mis-spelled as linguini. As with other pastas, it is paired with certain sauces and foods that are enhanced by the pasta's ability to hold onto the best amount of sauce or ingredients. Substitutes: Any other pasta shape; angel hair, Fettucini, Penne, Rigatoni, Ect. quinoa pasta or as grain, Polenta. Choosing: Dried pasta is available at all major grocers. Look for semolina pasta as this is a high quality grain. Fresh pasta is available at specialty stores and occasionally in the "fresh case" at high end grocers. While many people choose pasta rollers or machines, fresh pasta is incredibly easy to make and requires no special tools or skills other than a rolling pin an good upper arm strength. Buying: Dried pasta is usually on it's own aisle or section in the grocery store. Fresh pasta is available at specialty stores and farmers markets. Procuring: Contrary to popular belief, pasta does not grow on trees. Bring a pot of water to a boil, add salt and pasta, ook for 9-10 minutes. Don't add salt before the water is boiling. Salty water boils at a lower temperature. Cleaning: After cooking, rinse quickly to remove any extra starch. Store dried pasta in a covered container, in a dry cool place. 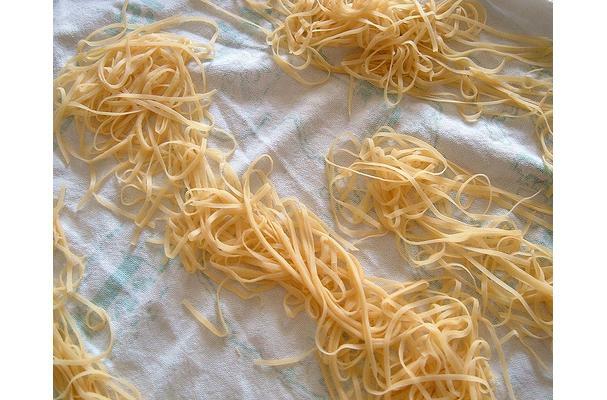 The name linguine means "little tongues" in Italian. History: Liguria where linguine originated is on the coast of Italy, which was why Linguine and seafood became a natural pairing. I do agree with all of the ideas you've introduced in your post. They are very convincing and will definitely work. Still, the posts are very short for starters. Could you please lengthen them a little from subsequent time? Thanks for the post.